My Dogs Love Me: 2.5 Awards!!! I apologize for not immediately posting regarding these 2.5 wonderful awards from two awesome bloggers. 1. I'm an licensed Electronics Engineer who'd rather talk about dogs and work on arts and crafts. However, I still troubleshoot computers and do house calls to earn extra money. 2. I watch anime and like playing RPG games in different consoles. I am guilty of playing my fair share of RPGs such as Resident Evil, Parasite Eve, Final Fantasy and Persona. Like Helen, I've also spend countless hours in Pokemon Yellow, Crystal, Silver, Gold, Sapphire and Ruby. 4. Some of my pets included fishes, love birds and a snake-neck turtle which escaped his pond during a really heavy rain. Poor Chipy Turtle, I'm still hoping someone found him, picked him up and made him their pet. 5. I love cheese! I mean seriously... pizza, cheeseburger, spaghetti and usually anything with cheese. Now, I would love to share this award to the following bloggers. Two Doodles and a Dane - Samson, Dante, Daisy Boo and mom's blog. Sampson is so funny. It seems that he hasn't realized that he's grown enormously through the months. White Dog Diary Online - I personally love the effort placed on every post by White Dog Army and their mom. When I Grow Up I Want to be a Vet - Doctor has the cutest comics skits. 24 Paws of Love - The current entries are about Blaze and how her husband has made a majorly hilarious discovery. Okay. This isn't done yet. So kindly bear with me while I'm in the middle of editing this post. I'd like to thank the Charming Chi for passing me two more awards which I am passing as a 1.5 award due to the following reasons: 1) they're so tiny and 2) they're so tiny. Since the Liebster means dearest, so I'm going to pass this award to 5 other people who I feel are dear to me. 1. Bowie - I still can't take the image of you wearing that little Korean dress out of my mind. 2. The Chronicle of Woos - Although I have to constantly look at the pictures of your four wonderful doggies to see who did the mischief this time, those pictures are just worth the effort. 3. The Emptynesters Family Daily - Debbie, I know you're guilty of making those cool Superbowl jerseys. Now, if you could only teach me how to fix my crocheted sweater. 4. Life with Desmond - Desmond, like any other dog, probably doesn't know he's comical personality just works wonders to his family's life. 5. Gracie Lu the Shih Tzu - Gracie Lu reminds me so much of Buchi... except for the dresses. Keep those adorable picture compilations coming. In order to accept the award, I have to pass it along 8 wonderful bloggers who are so PAWSOME as well. 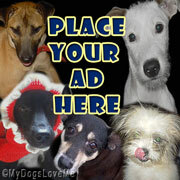 Here are the other blogs that bring me fun, love, laughs and furiendship. I know some of you have already gotten it, but I wanted to re-share it with you because I just think you guys are so PAWSOME, too. 5. Dachshund Nola - I've always wanted to pass an award to you. Wow, it took me some while to compile this list. Thank you for taking your time reading my post. I know it was pretty long. Thanks for the award! We'll get Mommy to blog about it as soon as she's able to (our sister tortoise had an accident today and passed away from extensive injuries). A sister tortoise!!! Oh the poor dear, take your time. It took me a long time to finally type all of this in. You're welcome and I hope sister tortoise gets better. I'm sorry about sister tortoise :( I just visited your blog and read about it. Congrats on your awards, you have a brilliant blog! Awww. Shuckins. Thank you. You guys are so adorable... I can still recall the unintentional stroll by Dip-Dip. Thanks so much for the award and I will try to dig up the pattern for the jerseys and blog it for all the football fans out there. Congrats on all your awards too! That'd be great. They actually look really nice. I can't wait to see them soon... I hope they can be hand sewn. 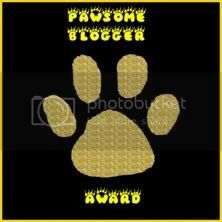 Aww, thanks for the Pawsome Blogger award!! And congrats on your awards as well!! Well deserved!! FYI, I tagged you on my blog for a little Q&A!! Awww. Thanks Higgins. I saw you tagging me. I'll get on that soon enough. Congratulations on your awards! Thanks so much for sharing it with me. You're welcome. Hope your assistant finds time to squeeze this in. 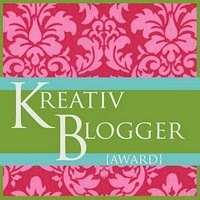 Aw, thank you for the Kreativ Blogger Award Haopee! And congratulations on your well deserved awards! I will go visit the other blogs you mentioned - they sound wonderful! They truly are. And yours is as well. That's alright. Bumping into each other in this blogging community is not something foreign for us. Thanks for tagging me. You're welcome! To the success of canine rescue and fostering!!! Thanks so much for telling us a bit more about yourself. And congrats on your super awards. Thanks for sharing with us. Mom hasn't been very good about helping us blog lately and we have a whole bunch of awards to talk about. We will get down to business soon. I perfectly understand. I know you guys are on snow alert so do take your time. I hope your mom gets better. Hi there, it was great getting to know you a little better, and you are so deserving of all those awards!! Yes, I love cheese so much. Wow, this was a response last February 10, it took me such a long time to reply. Hehehe! Well done Haopee on your 2.5 awards! It is great to find stuff out about your too. Looks like you, I and Snoopy has cheese in common? What? Not good for you? Even just a little bit?!? The HORROR! Oh, the HORROR! Oh you are soooo kind. And here I haven't been feeling "pawsome" at all lately. Thank you so much. And congratulations on all your awards! Well deserved. I loved reading about your little 'secrets' - very cool! Thanks for sharing. I just love people who help dogs. I think you and Bella are a great team. Those are some very cool awards! You visited me ^_^. I'm so happy you dropped by. Congrats on your awards! Mum loves cheese too...she could live of cheese if she could, BOL! Thanks SOOOOO much for out award, the bit about Sampson seems to be true, we still think he thinks he is the smallest one! Now there's you, I ,Carolyn and Snoops who love cheese! As Chihuahua have no perception of their size, Samson doesn't either. Thank you. I feel the same with your blog. They're so wonderful especially when I get to hear good news about kitties being adopted. HOLY SMOKES, that's a lot of awards you've got there, haopee! phew! thanks so much for passing one along to us. desmond is very proud.